Posted on October 23, 2017 by Elizabeth E.
My nephew’s wife, Grace, wrote to me and asked for help. She is a young quilter, who makes awesome gooseberry jam (she shared a jar with me), so I wanted to help. 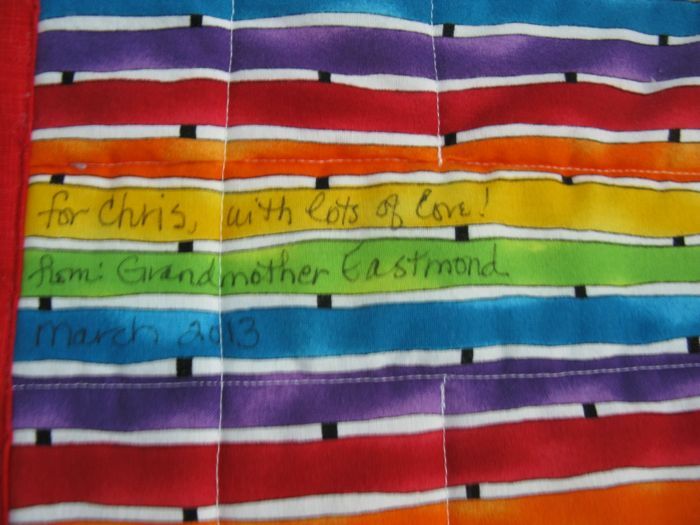 The quilt was for someone close to her who had just been diagnosed with breast cancer, and she thought a quilt was needed. I agree. She sent me the screen shot you see above, and since it was on Pinterest…and you know how much I LOVE their search engines (NOT), I thought it was easier to draft it on my computer using QuiltPro than try to find the original design (I tried…and failed…but kudos to whoever dreamed it up). 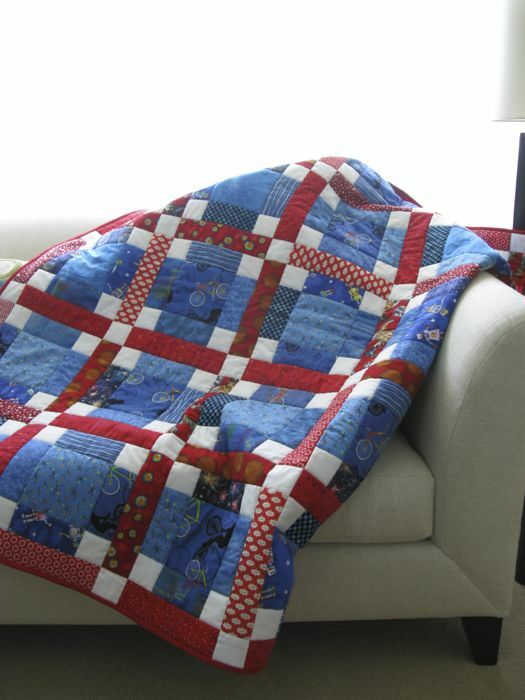 Besides, that was one of those “barn” quilts, painted on wood, not a cloth quilt. This is what I came up with. But I knew Grace wanted to move quickly, and yeah–all those pieces? I thought about my Home Sweet Home mini quilt, and how she could make fewer blocks, but bigger blocks, and I modified it as on the left. Nope. Those middle petals look like cookies or fingers or something. I left the pattern in the same, but just colored it differently, and came up with the one on the right. I sent it over. 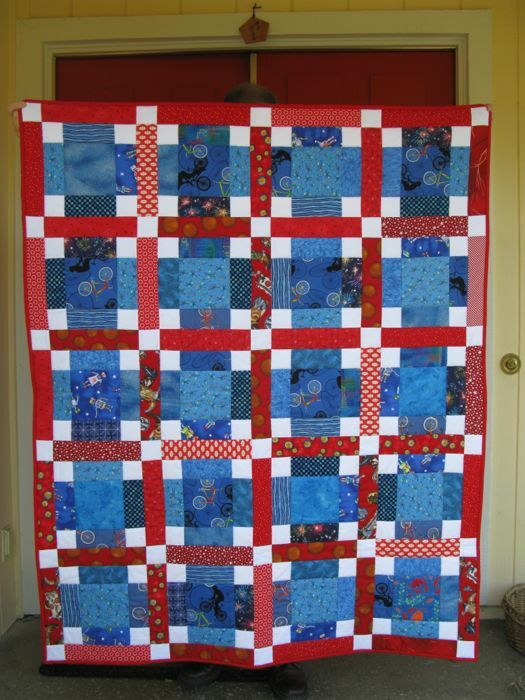 I think it will be cute quilt. This is a 10-inch block and I thought you’d like to have the pattern, too. Each is a PDF file which you can download. It can be made in reds and greens and be thought of as poinsettias for Christmas. Or made to commemorate Anzac Day in April, for the Australians. Or red and white for a bouquet of posies for Valentine’s Day. Have fun, but please don’t print off dozens for a class or for your friends–send them here to get their own free pattern. Thanks. About QuiltPro: they do not pay me or give me free stuff. 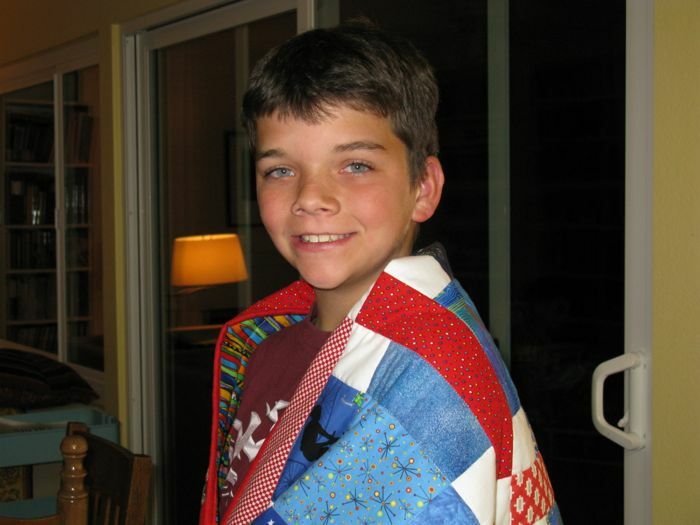 I started using that quilt program eons ago, and they are still going strong. If you are struggling with the current software (I know, I have it and love/hate it too), consider trying this software, as it’s based on making shapes, not connecting lines. I find it pretty intuitive, but as with anything, there is a learning curve–it’s just that theirs is not quite as steep. Making that block added to my collection of red and white triangles (ignore the interlopers in the upper right corner). I trim them to whatever measurement’s closest, without it being a weird number, and save them. Every once in a while, I sew them into four-patches. Take an old piece of clothing, adhere it to a canvas and paint it like something else. Create a composition by taking a square of black paper, cutting out some shape and using the negative and positive pieces. This assignment will use only two colors, but you may use any range of those colors. And so on. There are many books out there in the marketplace for guided creativity, but they all start with a rule. Sometimes I find little bags of treasures in my sewing room, with pieces inside that have been collected according to some rule. Like the red and white triangle rule. Or the 3-inch square rule, but I kind of think that last one’s a bit of a cheat. So that’s my rule and I’m sticking with it: red and white triangles, although seeing this quilt again does make me wonder if I should break it. PS. I did adhere that old piece of clothing to a canvas and paint it. It was a maternity shirt, which I stuffed and painted it like a landscape: three mountains and a river. Somewhere I have a photo of it, but the original was mercifully carted off to a dump somewhere. Posted on March 24, 2013 by Elizabeth E.
Full length shot on our front porch, with hands belonging to my tall husband Dave. 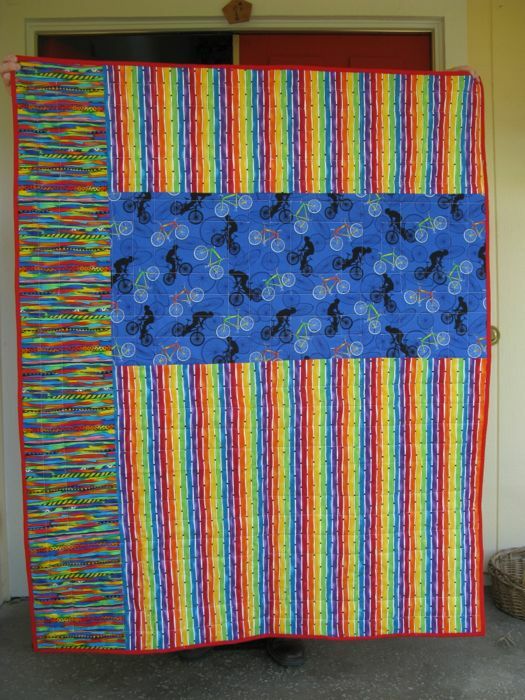 This isn’t a complicated quilt, it sews up quickly, and I love using favorites from my stash like the bicycle fabric. I’d been saving that for a long time and this was the perfect use because my son (Chris’ Dad) loves bike riding, owns a bunch of them and takes all his sons out on bike rides. The “label.” Sometimes with quilts I know will be washed and washed, I don’t mess with a formal label, but simply write directly on the quilt with a Micron Pen. Glamour shot, reclining on the sofa. 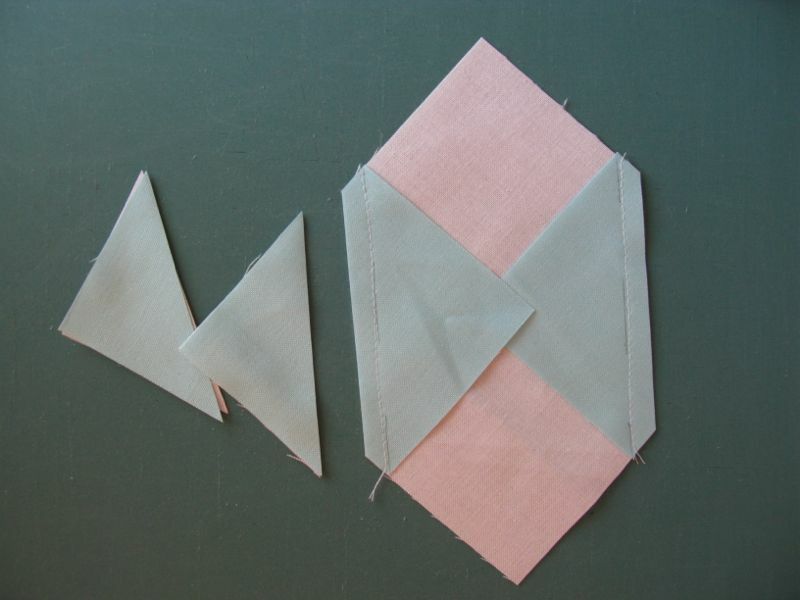 I did the basic quilting: stitch in the ditch. 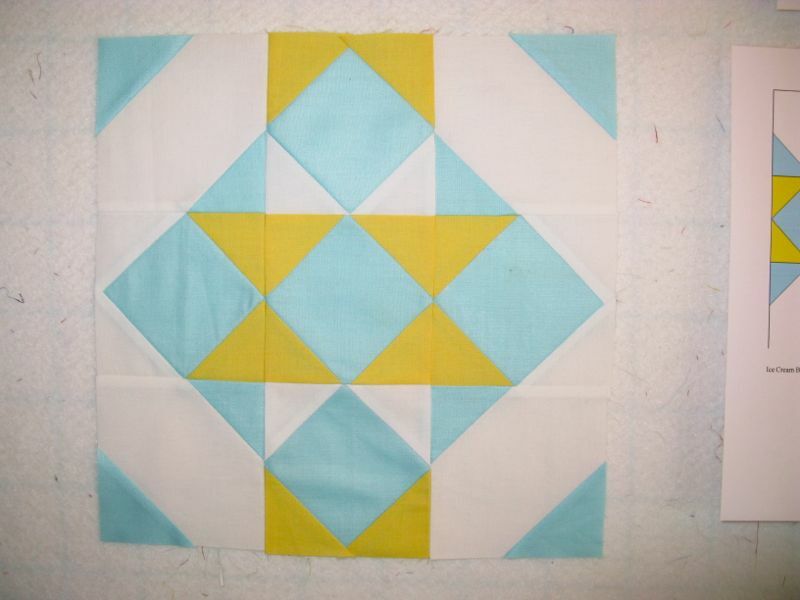 I’d played with the idea of doing echo-quilting alongside the seams, but in the end changed my mind. I gave it to Chris as they arrived on Saturday evening to celebrate my husband’s birthday. Chris’ younger brother Andrew used it first. Later on, after dinner and all the adults talked, Chris nabbed it and settled into a movie. Or was it a game? 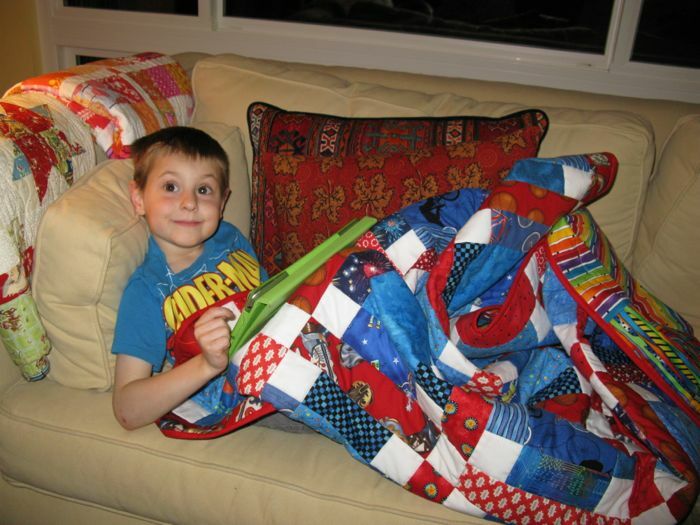 I can see that at the dimensions of 46″ x 57″ he will soon outgrow the quilt, but I didn’t want it too big–it’s a “welcome to the family” quilt, like what his brothers received when they were newborns. Chris seems to like it–I’m so glad! 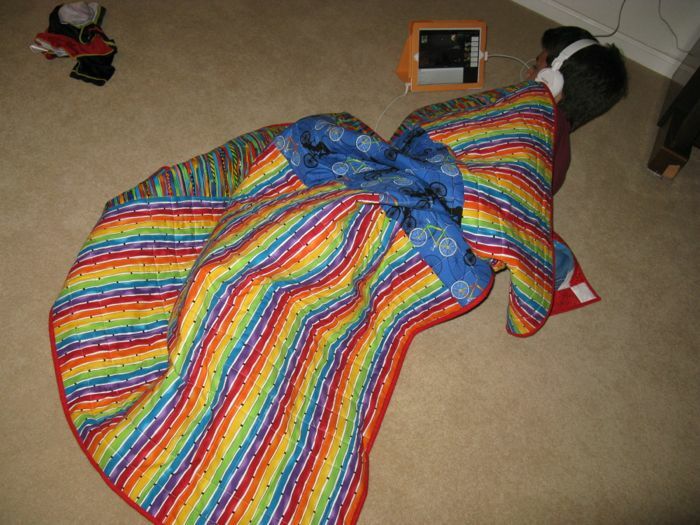 It’s Quilt #109 on my 200 Quilts list. 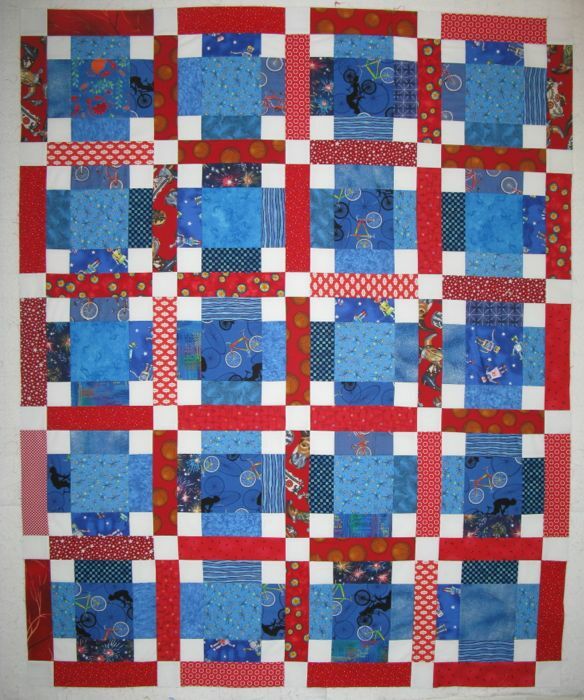 Posted on May 28, 2012 by Elizabeth E.
Each block has three colors: main color (color A), white (color B) and accent color (color C). 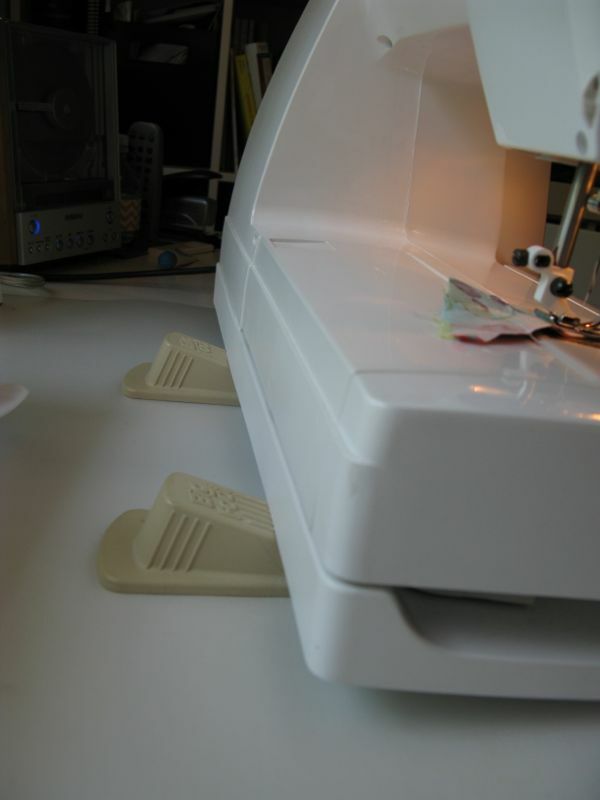 Now ready, set, sew by propping up your sewing machine on door stoppers as the angle of your machine makes you less tired. I learned this at a quilt show, which is why it’s always a good idea to take classes once in a while. You can’t learn everything on the internet. You need some way to mark the diagonal lines. Of course, you can eyeball them, but if you’re like me, your straight-stitching skills go out the door. 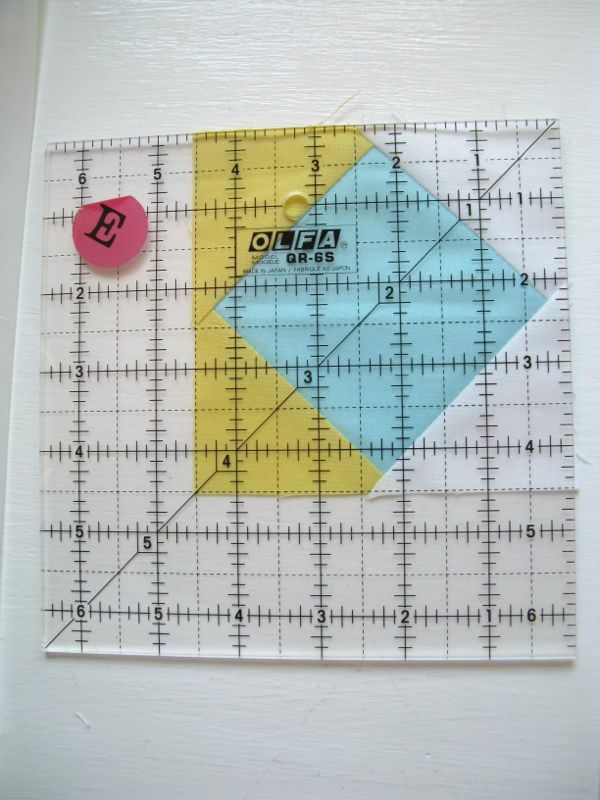 This is called a Quick Quarter tool, and you can find it at JoAnn’s. Often I’ll use a template with lines marked that affixes to the bed of the sewing machine, but I just went with this for one block. That latter-not-shown gizmo is called “The Angler” and is worth every penny of the eight bucks it cost. 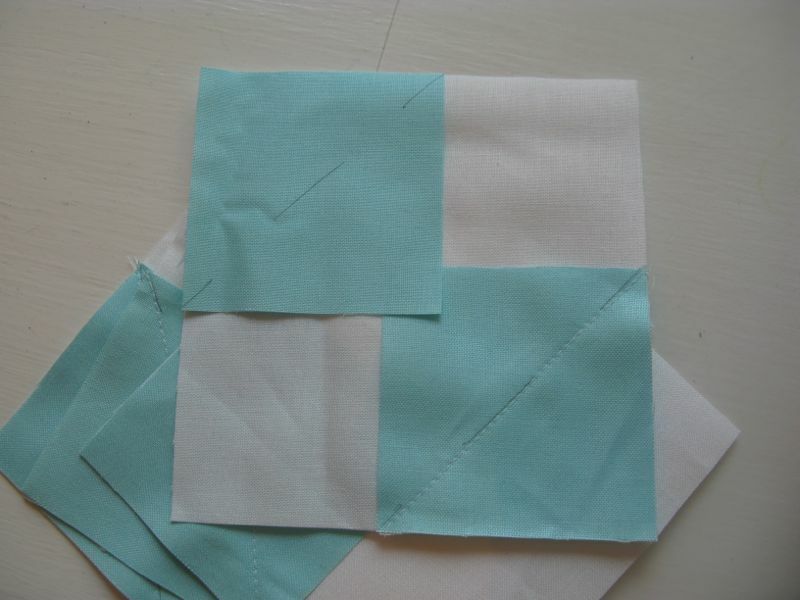 Align the outer edges of the small square with the large square and stitch just to the side of the pencil line, moving your needle towards the outer corner. You can see it in this photo here. My stitching line is not ON the pencil line, but towards the outside edge by a couple of threads. This allows you room for the fold, and so it won’t distort the shape of this smaller unit in your block. 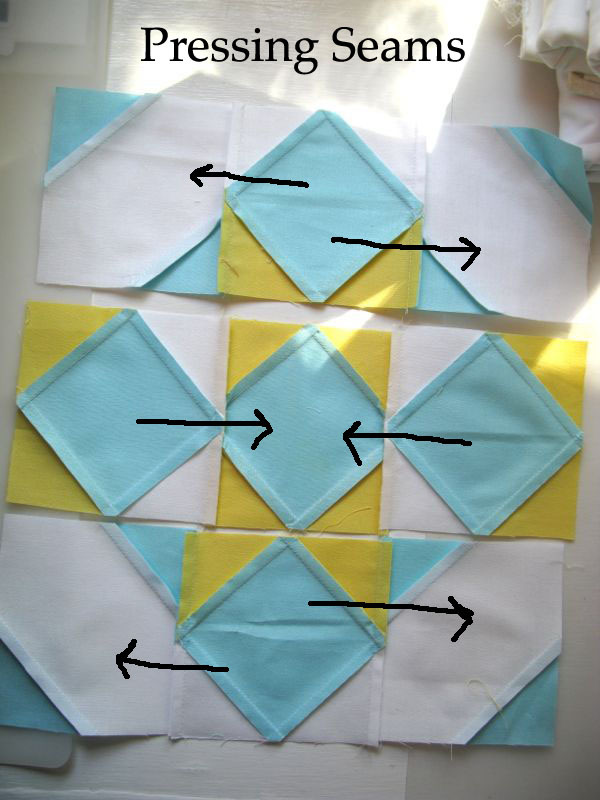 Sew on as many of these corners as you can, as it saves time to do a bunch of sewing, then a bunch of ironing/pressing, then a bunch of trimming. But I’m sure you already knew that. This is the part where you should turn off your music or that novel you are listening to, because you have to think CAREFULLY about what part should be cut off. 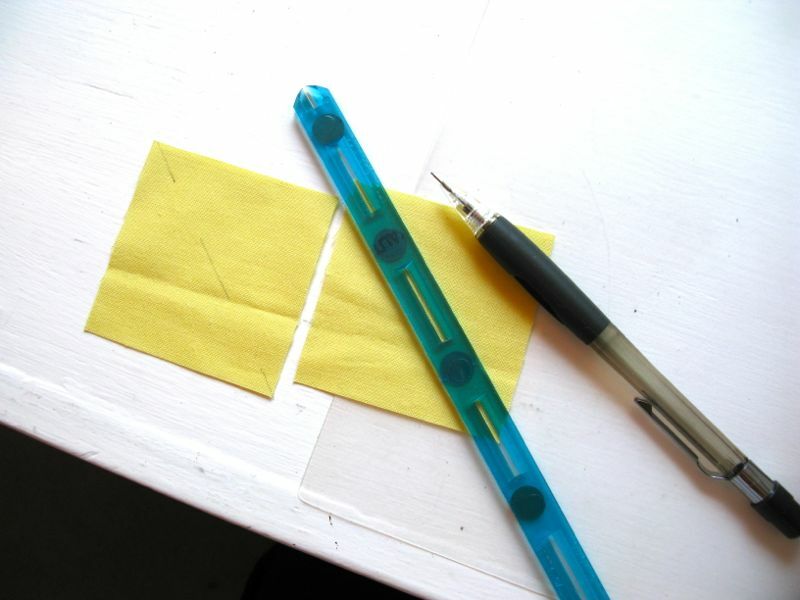 I remember it by placing the ruler over the part I want to preserve, then lining up my ruler. I then cut 1/4″ away from that stitching line. Yes, you are making a bunch of snowball blocks. Keep trimming. Love how the white looks pink. But, it’s white. 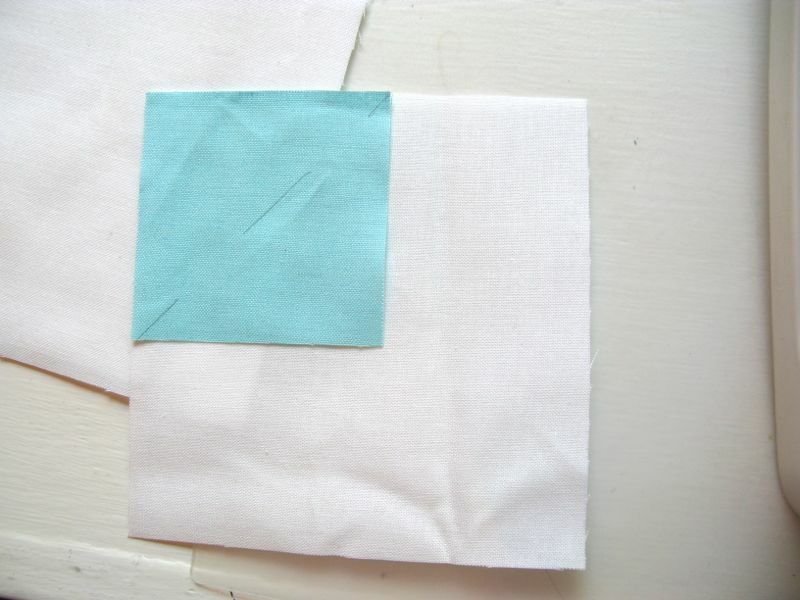 After trimming, head to the ironing board and press the snowball corners away from the center of the larger square. Unit #1 is done, all four of them. Set them aside. And yes, I press my seams to one side. 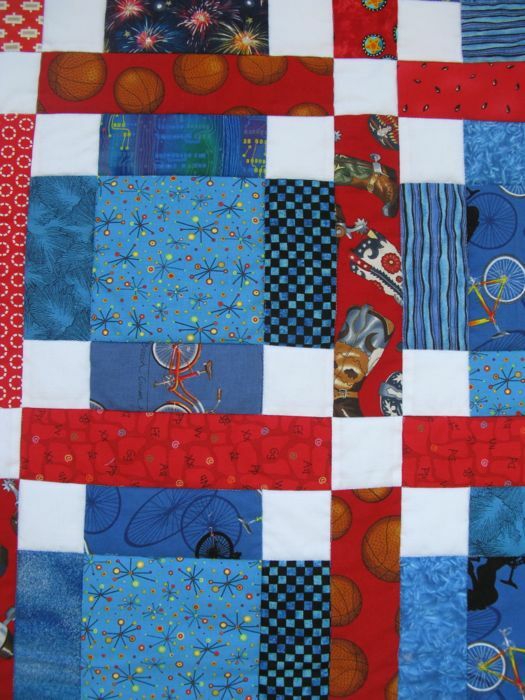 It’s not a gospel with me, this press-seams-open business, like it is with some modern quilters. If it is with you, have at it. 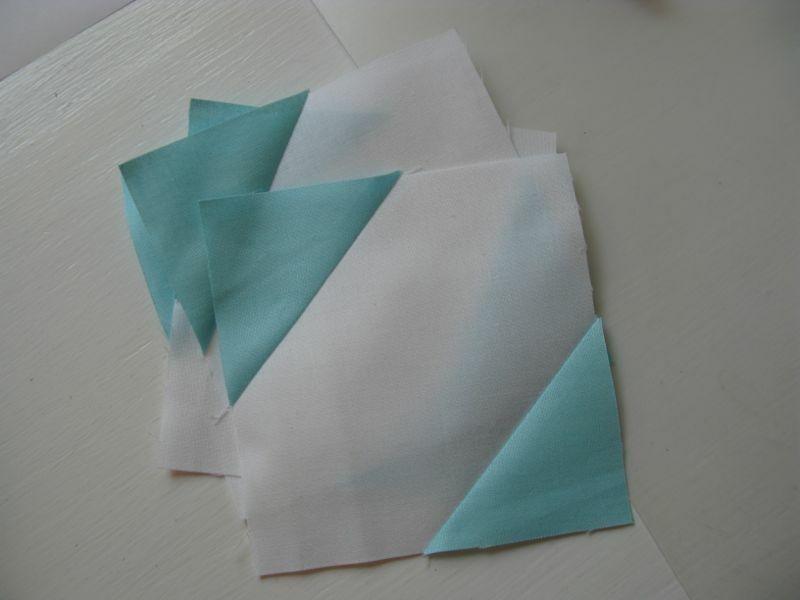 I prefer them pressed to one side because I own several old quilts, and they are still sturdy although worn, and I haven’t had to sew any seams back together from popping apart. Since pressing to one side works for me, I’m sticking with it. 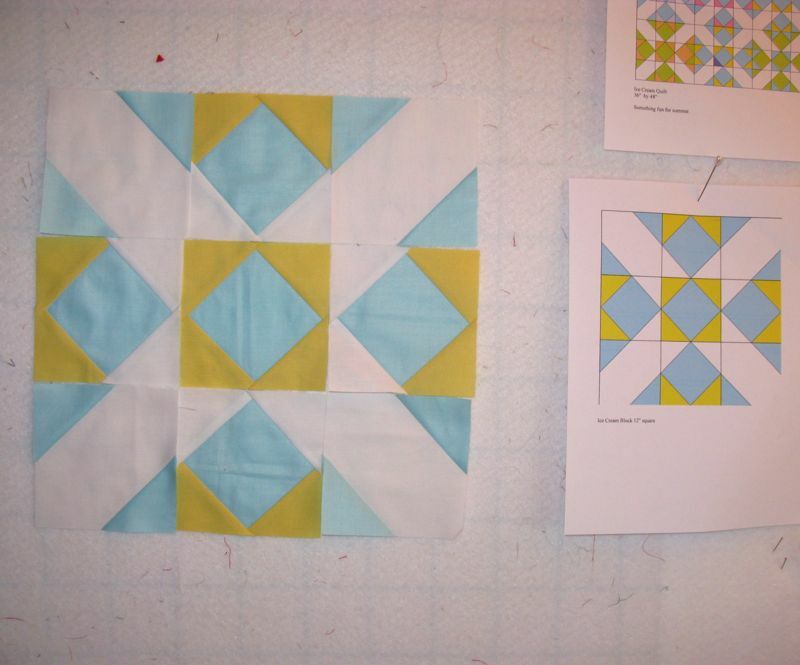 I believe the thinking it that they look “flatter.” Judging from the appearance of my older, worn quilts, um . . . that’s really not an issue after a few years. First corner is on, so lay out the next set of stitching. 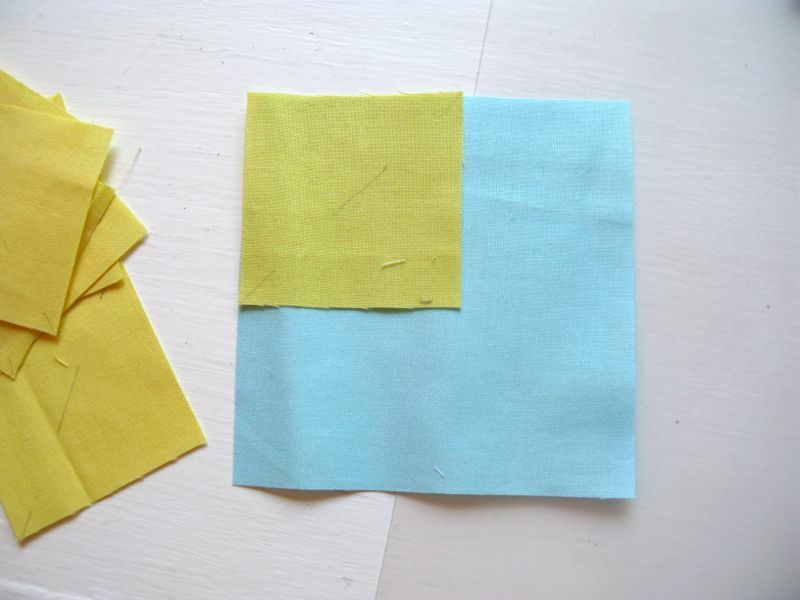 I put the yellow square opposite on one of my squares, to remind me that only one has all four corners that are yellow. Stitch, again staying a few threads to the outside edge of your pencil lines. Chain stitch as many as you can together. I found that by focusing on my end point and going a bit faster speed, my stitching line was straighter than if I obsessed about staying next to the pencil line. 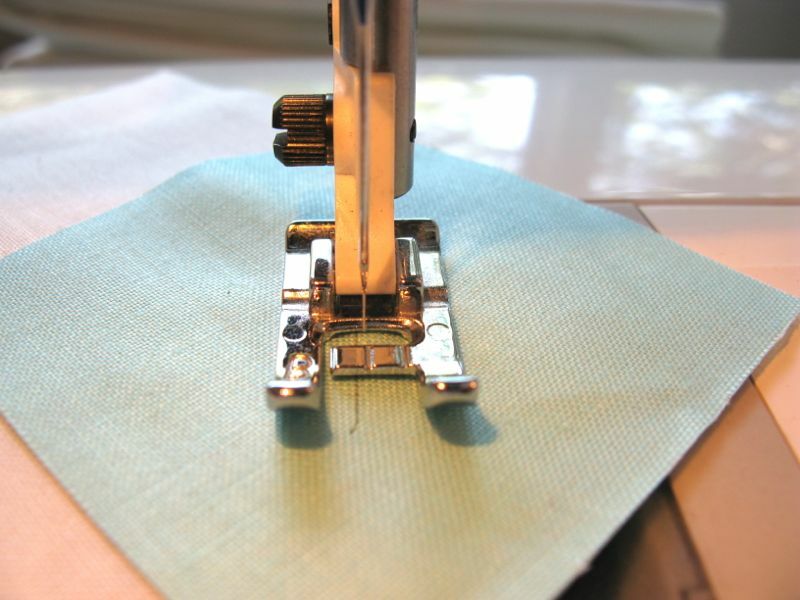 Aim for a straight seam, as my college Clothing and Textiles professor used to say. See that thread cutter on the back of the machine that you sometimes use? Use it now, letting it cut your sewn units apart. Quick! and easy. Keep sewing. Keep trimming. Keep pressing. Repeat until all the snowball corners are on all the blocks. Give these units another final press if you haven’t done so already. Now eat your vegetables, by taking time to true up all the units. I learned long ago that by truing up the inside units, there is less distortion in the final block (and usually I never have to true up those). 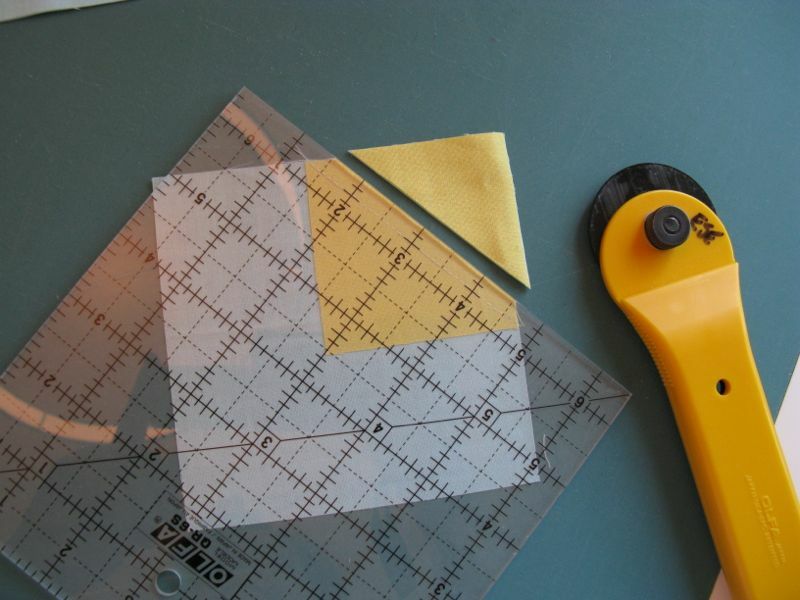 If you are a newbie quilter, it simply means to lay a ruler over your block/unit and trim off those slight edges that don’t belong. I also take this time to get it back to “square” by checking the diagonal and making sure it runs from corner to corner. All the units are trimmed up, and I laid them out next to my “pattern,” a print-out of the block. 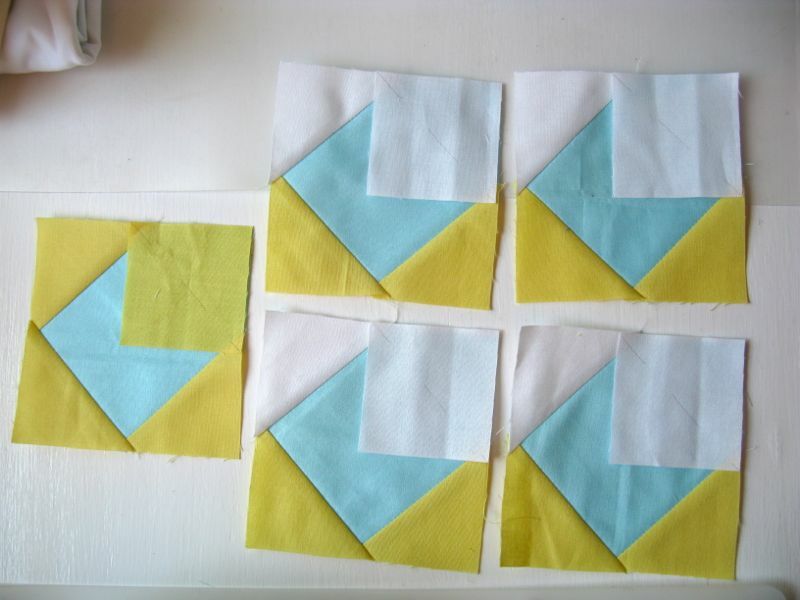 Now sew the first row’s units together, then the middle, then the last row. To make sure those intersections line up, stick a pin through them (top photo). 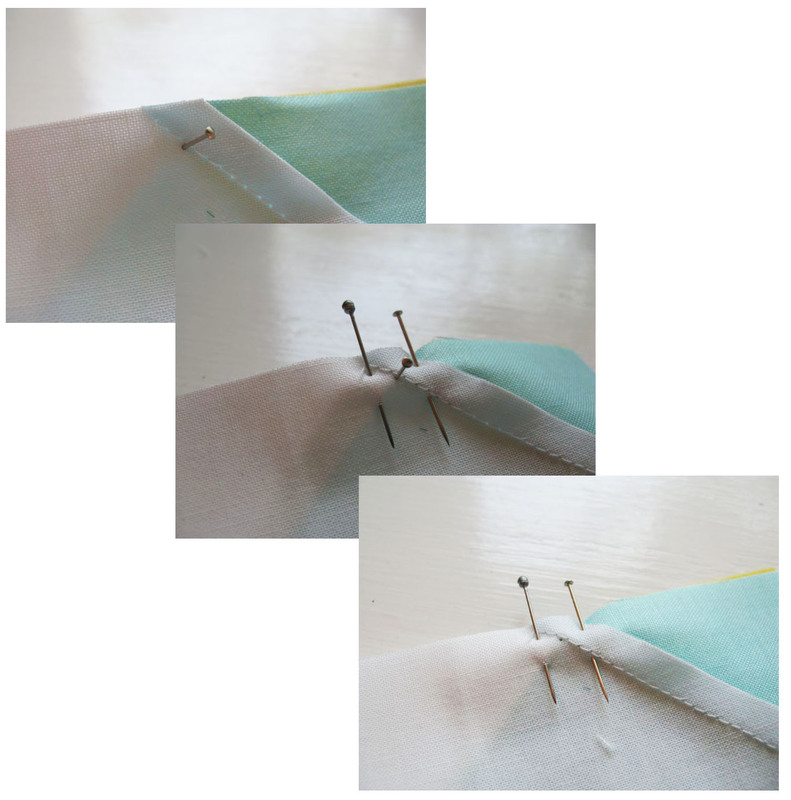 Straddle that pin on either side with two other pins, then remove the placeholder pin (bottom photo). It shouldn’t shift now under the needle. This is how I pressed my seams (seen from the back). I like to be able to nestle the seams together by feel, so one has to go one way, and one has to go the other. 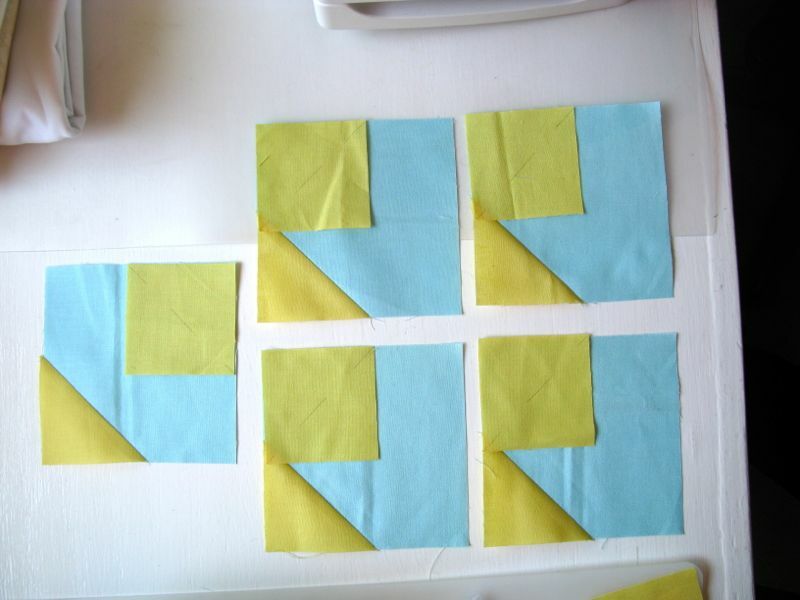 Now pin the rows together, then flip over the block and check them. Otherwise, if you are like me and are talking to your mother and wishing her a Happy 84th Birthday, you’ll sew them all together incorrectly. A nice block to be sure, but not the one I’m trying to make. Unpick. Re-stitch. Then give it a good pressing. How did I press these last seams? Towards the middle. Often a seam will make its will be known by how thick it is, or how many intersecting seams it has. Just be consistent. I do admit that if it’s a really pesky, lumpy intersection, I may press just that part of it open, leaving the rest of the seam pressed to one side. Experiment, but remember you are making these quilts to last. And last and last. And that’s it! Now make 11 more, throwing in a random darkish patch here and there to keep the eye moving and give it some interest. Or not. 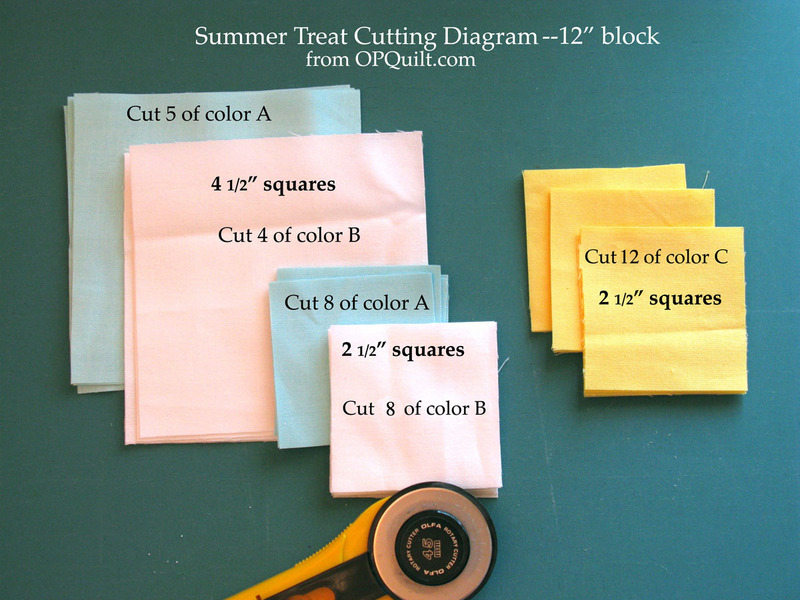 Happy Summer Sewing. 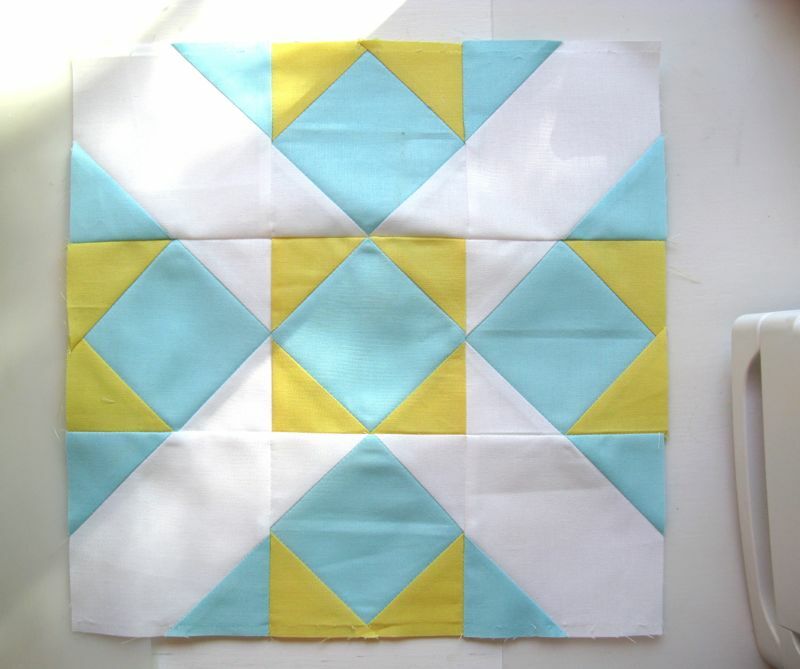 Now I’m off to figure out my gingham quilt!